Son of an eye surgeon. He was born during a stay of his parents in Florence. His parents decided to stay in Europe. When he was thirteen he had water colour lessons by Carl Welsch and in Paris he studied under Carolus Duran. In 1874 he was admitted to the École des Beaux-Arts. He was soon recognised as a remarkable talent and he met people like Degas, Rodin, Monet and Whistler. He started with landscapes, but influenced by Carolus Duran he soon tried his hand on portraits. In 1877 his portrait of Fanny Watts was admitted to the Salon. He made a trip to Spain where he studied the work of Velasquez and he also traveled to Italy. After his return he received many commissions for portraits. His "Portrait of Madame X" (1884) led to a controversy after it was exhibited in Paris. He had trouble getting new commissions in France and moved to London. In 1887 he had his first succes in England with "Carnation, Lily, Lily, Rose". It was bought by the Tate Gallery. He visited New York and Boston and painted many portraits there. Back in London his work was much asked for and Ellen Terry was among the many celebrities who sat for him. He frequently visited the USA but he continued to live in London. He was very famous now, but in 1907 he grew tired of all these portraits. He closed his studio and returned to landscape painting. Occasionally he still executed portraits and from 1915 to 1917 he was in the USA, where he painted John D. Rockefeller (1917). 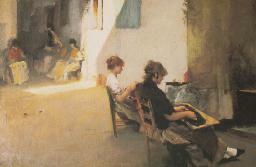 In 1918 he was commisioned as a war artist in England and painted scenes from the First World War. 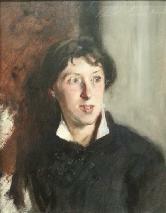 Sargent never married but there were many rumours about his personal life. Some thought he was homosexual but it seems he had many relationships with women. He died in 1925 in London and was buried at Brookwood Cemetery near Woking. 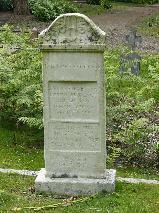 The grave of John Singer Sargent at Brookwood Cemetery, Woking. "The Bead Stringers of Venice". "Madame X (Madame Pierre Gautreau)".